For better or worse, acclaimed first-time directors often seem to run as far in the opposite direction as they can when mounting their follow up film. 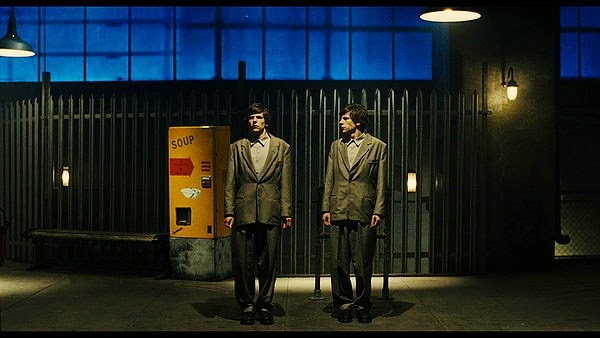 Like the charming Submarine, Richard Ayoade's second directorial effort The Double seems to take place out-of-time, albeit with more retro-futuristic leanings this time around, and that's really just about the only similarity I can think of. 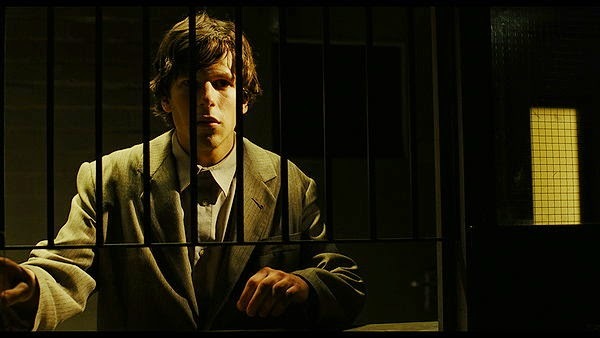 Jesse Eisenberg plays Simon James, an admin worker who files inconsequential reports about unspecified subjects, for employers who don't recognise him after seven years of working there. Just about the only thing that keeps him going through his daily purgatory is his attraction to fellow employee Hannah, a girl who works in reprographics and lives in the opposite apartment block. But things get markedly worse for Simon, with the arrival of a charismatic new colleague, James Simon, who is literally the equal and opposite of our bewildered hero. The script, by Ayoade and Avi Korine, is based on a novella by Dostoevsky, and the director projects it through the prism of Terry Gilliam's Brazil. Having been released so soon after The Zero Theorem, which felt more like a sophomore effort than this one does, it may appear as if the homage has out-Gilliamed Gilliam. He swaps out the confusion between Buttle and Tuttle for an amusing lack of acknowledgement for the fact that these two different people look exactly alike, but the exasperated style is recognisable. Ayoade shadows the style and tone of that film, in much the same way as James shadows Simon. The relationship between the two doppelgangers starts out reasonably enough, but would ultimately be measurable to the junkyard fight from Superman III, (the only real highlight of that movie) if James' gradual hostile takeover of Simon's life wasn't so much more subtle and cunning. To use another highbrow reference point, look at the EE adverts that have different Kevin Bacons together, and imagine that this is like Adventureland Eisenberg being psychologically tormented by Now You See Me Eisenberg, and the result wouldn't be far off. Eisenberg is one of those actors who is sometimes unfairly hit with the "only does two performances" label, and this shows his mettle nicely. Just because we've seen him do both nebbish-y roles and arrogant roles before, it doesn't mean that he ever regurgitates previous tics when he's asked to do both in the same film- he's arguably better at each of those types that we've ever seen him. Everything Simon touches goes wrong. or literally falls apart, and the strangled shyness that comes out of that is utterly sympathetic. Meanwhile, James makes for a sly, ruthless and yet charming antagonist, with something of what I imagine we'll see from his Lex Luthor, come 2016. His performance as Simon is what really grounds the film. When the film properly goes full-Brazil, James sometimes disappears into the mass of infuriating buffoons, played brilliantly by the likes of Wallace Shawn and Kobna Holdbrook-Smith, that keep Simon down. It's an intentional sign of how James gets along better because he understands the banality of it all and is willing to play off of it to get ahead, but in those full-Brazil moments, it feels like the film has about as little grasp on its own identity as Simon does. There's also an odd, if not unexpected reuse of the cast of Submarine and The IT Crowd in supporting roles and cameos- they're all great actors, but this isn't a Cornetto movie, and it actually becomes distracting over time, because the "Hey kids, it's Chris O'Dowd!" thing doesn't really suit the tone. Paddy Considine's role, in the background as a leather-clad TV future cop in a 1980s sci-fi pastiche, seems to have been dreamt up expressly for the sake of a fun DVD extra further down the line, although to be fair, I'm really looking forward to seeing that DVD extra. But while James shadows and then overtakes Simon, it sometimes feels as if Ayoade is overtaken by his own references. I couldn't have carried the expectations of Submarine over to this, as it's a very different story, but comparing the two shows how Ayoade doesn't do exasperation nearly as well as understatement, and the best moments of this one are more reined in and darkly funny. They're the moments in which you root for Simon, who is crippled by his own soft-spoken nature, to get mad, to get the girl, to get his life sorted out, and that's what really keeps you intrigued through the carnival of Brazil-ian bureaucracy that sometimes feels more aped than homaged. The Double is a much chillier film by Richard Ayoade, and the bursts of ecstatic visual fantasy that made Submarine so unassumingly delightful are pitched with a little more irony this time around. Not everyone has taken to it, but there's a lot to like here. Even if there had been nothing else to recommend, Jesse Eisenberg is on unbeatable form here, (and so is Jesse Eisenberg) and it has perhaps the most apt final line of any film I've seen in the past 12 months- a perfect cap on a singular film in which the affecting premise is sometimes overtaken by the more brash homages at work. The Double is still showing in selected cinemas nationwide. If you've seen The Double, why not share your comments below? Can we have a Darkplace-style full series of Paddy Considine, future cop, please?